Given the extremely demanding applications that construction industry equipment is designed for, and the harsh conditions it operates in, product quality is of paramount importance. A fundamental aspect of the quality of products that are subjected to such demanding work is the standard of the materials they are manufactured from. To help ensure that Altrad Belle products adhere to exacting material specifications, the company recently invested in an advanced, portable Brinell Hardness Tester from Bowers Group. Based in the Derbyshire Peak District, Altrad Belle manufactures an extensive range of products for light construction, including cement mixers, compactors, twin drum rollers, trench rammers, mini-dumpers, snowploughs, tile saws, bench saws, floor saws, trowels block splitters, diamond blades, wheelbarrows. The history of Altrad Belle dates back to the 1950's when founder Doug Blackhurst searched for a cement mixer to help build his new house. No small portable cement mixers existed, so he set about designing one. The result is the now famous Belle Mini Mixer range. Following the phenomenal success of the range, the company soon diversified into other related areas. The world famous Company now offers a range of over 100 different types of machinery. Altrad Belle’s impressive success within global export markets was recognised in 2008, when the Company was awarded with the highly coveted Queen’s Award for Enterprise in International Trade. Altrad Belle was acquired in 2009 by the Altrad Group, a dynamic International Group with 105 subsidiaries in 18 countries around the world fast approaching €1 billion turnover. The Altrad Group has its head quarters in Montpellier, France and Dr Altrad, the CEO of Altrad, a French entrepreneur is also the owner of Montpellier Rugby Club who competes in the Heineken Cup. As they are intended to be used across the globe within the most demanding of environments, Altrad Belle ensures that each of its products feature robust, efficient designs that result in effective operation and enable them to stand-up to the rigours of continuous hard work. To help guarantee the continuity of its excellent reputation for the functionality, quality and longevity of its products, Altrad Belle administers an exacting quality control regime. In addition to checks made throughout all stages of manufacturing, in-depth final inspection routines are also undertaken. Since the acquisition, the Altrad Group has made further heavy investments into the UK manufacturing site of Altrad Belle. Investments were made into new CNC turning and machining centres as well as CMM (Coordinating Measuring Machine). Richard MacPhail Quality & Maintenance Manager explained. “Altrad Belle is a major manufacturer of light construction products, our various product ranges are designed and manufactured taking into consideration the expectations of our customers, the specific needs of each market and the various standards that are in force. “Vigorous product testing is undertaken to ensure the highest quality standards and adherence to all relevant health and safety requirements. All Altrad Belle machines are in conformity with EC legislation related to safety issues such as hand-arm vibration levels, noise levels and other security standards. “The nature of the environments they are used in, and the kind of tasks they perform, means that to guarantee the quality and long service characteristics of our products they are made from the best possible materials. 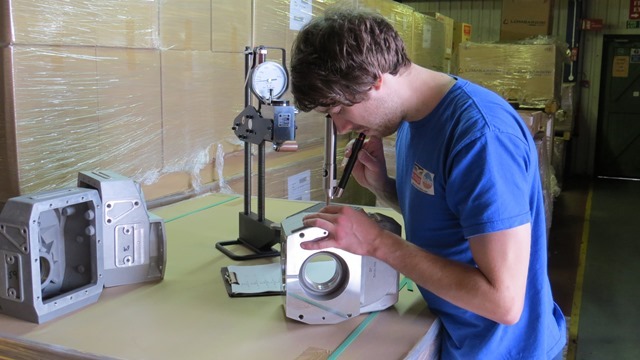 To certify that the materials we receive from our suppliers, and the components brought in from sub contractors, conform to specifications, we perform regular spot-checks at our goods inward department. “Our new King Brinell hardness tester is now in regular use and making an important contribution to our quality and traceability systems. Given the wide range of shapes and sizes of our components, it helps that the flexible King Brinell hardness tester is capable of accurately assessing virtually any size and shape of metal specimen. “Although our new hardness tester’s results are fully traceable though the UKAS certified test blocks we purchased with the machine. As hardness is such a critical property, to ensure the validity of any readings indicating that raw material or components are substandard, we send the suspect sample or part to an external material testing laboratory for confirmation. By applying this level of vigilance and supplying feed-back to our supplier’s ensures the supply of the best possible materials and components. Bowers’ King Brinell Portable Hardness Tester is a lightweight, sturdy instrument that is capable of extremely rapid, yet accurate hardness test procedures that can be made at any angle. The tester has a wide measuring range and is ideal for use on aluminium steel, cast steel and cold work tool steel. A wide range of optional King Brinell accessories are available, including a chain adapter, reverse direction adapters, a standard test head with long ram, a low pressure test head and various bases that are able to accommodate larger specimens. To complement the King Brinell tester, Bowers also provides the Kingscan IV Automatic Brinell Video Microscope. For more information on Bowers' range of Testing Instruments, click here.